This is a wonderful cake, light, tender and very moist. The sweet taste of white chocolate is a perfect complement to the refreshing flavor of the lemon. Besides, white chocolate pairs incredibly well with pistachios; It makes just a perfect combination of textures and flavors, elegant and absolutely delicious!!! The inspiration for the cake comes from Chatelaine magazine, the August 2007 issue. 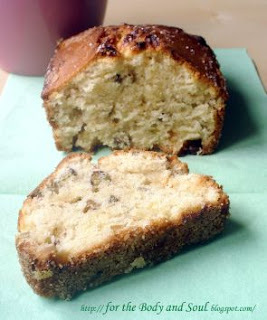 In the original recipe (which you can find here), it was actually called a loaf and was made without chocolate at all. Since I wanted to make a cake rather than a bread, I decided to add some white chocolate to the recipe. It adds extra sweetness and provides a little bit of richness to the cake. Note's to the recipe: I like pistachios with white chocolate most. If you aren’t into white chocolate much, you can use milk chocolate instead. If you decide to omit the chocolate completely, add 1/2 cup of sugar more to the batter for the right sweetness. This cake will keep well at room temperature 1 day, refrigerated up to a week or frozen up to 2 months. Enjoy!!! 1. Preheat oven to 350F (180C). Grease lightly a 9 x 5 inch loaf pan. 2. In a medium bowl stir flour with baking powder and salt. Grate peel from lemon, then stir in. Coarsely chop nuts. 3. In a large bowl, using an electric mixer, beat butter until smooth. 4. Gradually beat in 1 cup (250 ml) sugar until well mixed, 2 minutes. 5. Gradually add the eggs and beat well until light and fluffy. 6. Add the dry ingredients alternating with the milk. 7. Add chocolate and nuts and mix until ingredients are just combined. Do not overmix. 8. Pour batter into pan, bake until deep golden brown and a cake tester or skewer inserted into centre of loaf comes out clean, about 50 minutes. 9. Meanwhile, squeeze 3 tbsp (45 ml) juice from lemon into a small bowl. Stir in 1/4 cup (50 ml) sugar. It won't completely dissolve. 10. When loaf is baked, remove pan to a rack. Using a cake tester or skewer, immediately poke several holes in top of loaf. Brush or drizzle half of lemon glaze over hot loaf. Cool in pan 10 minutes, then remove the loaf. Carefully turn upside down. Evenly brush or drizzle remaining lemon glaze overtop. It's a nice idea! And it must be delicious! I'll try it! Why in Polish version you use 1 1/3 cup flour and in English version you use 1 3/4 cups? It's a substancial diference, and I'm not sure how much flour should I than use? ?